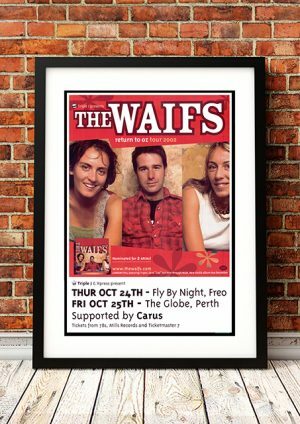 Classic Waifs Band Concert Posters and Memorabilia! Buy Online Now! 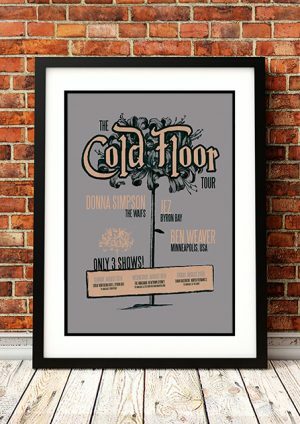 Originally performing Bob Dylan covers in and around bars in their native Australia, the sister duo of Vikki and Donna Simpson were known as COLOURS. Formed in 1992 and touring constantly in their homeland, the pair hooked up with Josh Cunningham during a stop in August 1992. A year later, they changed their name to the WAiFS. From there, the group released a cassette of original material but decided to head for Melbourne, the mecca of Australian music. A loyal following and hectic touring pace resulted in three albums: the group’s self-titled debut in May 1996, March 1998’s Shelter Me, and June 2000’s Sink or Swim. Folk festivals across the United States and Canada also fell in love with their sweet harmonies and self-described “wholemeal” music. Although the Waifs had released third album Sink or Swim in Australia in 2000, it didn’t arrive in America until 2002. The Waifs’ musical honesty was captured once again with their critically acclaimed follow-up, Up All Night, in the spring of 2003. The album went on to net the group four ARIA awards later that year. In 2004, the (mostly) live double-disc A Brief History… was released, though the Waifs wouldn’t deliver their studio follow-up until 2007’s Sun Dirt Water. A second live album, Live from the Union of Soul, was released in 2009 documenting their 2008 collaborative tour with labelmates John Butler Trio. Their sixth studio album, Temptation, arrived in 2011, by which time the band’s primary members had all settled down in different parts of the U.S.
By 2015, the Waifs had resumed touring in anticipation of their seventh album, Beautiful You, which was released later that year. To celebrate their 25th anniversary, they released the double album Ironbark in early 2017, and set out on a major national tour of Australia. We stock some awesome Waifs Band Concert Posters.